You can protect your newborn from the flu if you get a flu shot during your pregnancy, says the New England Journal of Medicine. Getting the flu shot during pregnancy reduces flu among infants by as much as 63%, but currently only half of women who are pregnant during the flu season get the vaccination, even though it is safe and has been recommended since 1997. 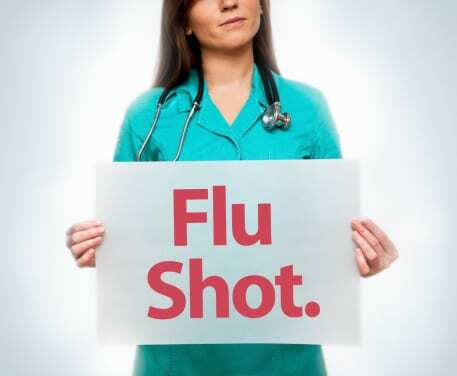 Some women may not know that flu shots are recommended for pregnant women. But the flu can cause major problems during pregnancy, including increased risk for complications such as high fevers linked to increased risks for certain birth defects and hospitalization for respiratory problems associated with the flu. Most healthcare providers typically give the flu shot during the second or third trimester, but if you’re an at-risk mom, such as someone who has asthma, the flu shot can be safely given even as early as the first trimester. The flu shot is also safe for breastfeeding moms and their newborns. How does the flu shot you get protect your baby after birth? Although the flu vaccine isn’t recommended for infants ages 6 months or younger, vaccinated moms can pass along protective flu antibodies to their babies while pregnant and during breastfeeding. If you’re concerned about thimerosal, a mercury-based preservative in flu shots, ask your healthcare provider for the thimerosal-free options widely available.